LENGTH X WIDTH X HEIGHT: 182.6 x 73.7 x 56.5 in. CARGO CAPACITY: 12.0 cu. 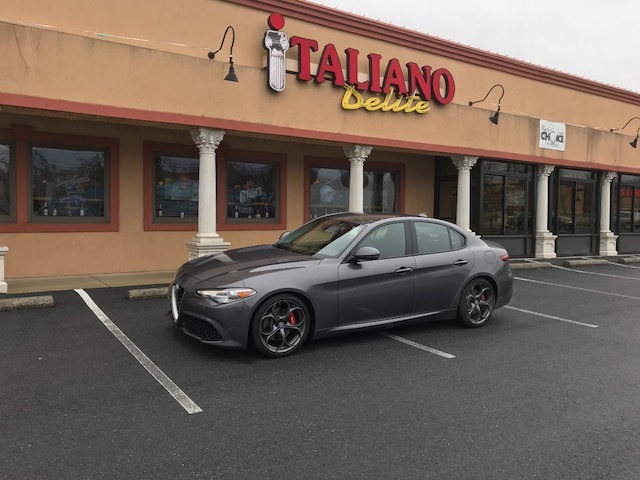 ft.
BOTTOM LINE: In many ways the Alfa Romeo Giulia is as quirky as a Saab 900, but its primary assets are fantastic Italian looks and stirring performance. The last time I drove an Alfa Romeo Giulia was back in Alfa’s previous iteration in the States. I remember that at that time pieces fell off the car and I couldn’t get the radio to work. No pieces fell off this version of the Giulia, but I still had radio problems. Tuning is a challenge, even after browsing through the owner’s manual several times. So we locked on to a SiriusXM channel that was preset and acceptable. Also, the on/off/volume control knob was located way back on the center console. It matched the engine start/stop button located on the steering wheel. I also recalled driving an Alfa Romeo Giulia for my navigator/owner Vic Wallder in New Jersey rallies back in the day. That was a fun car to drive, and Vic would never let me upshift, preferring to keep it in a lower gear to hear the engine whine. Hey, it was his car. This Giulia had a similar sound. It seems to want to go on forever when you’re accelerating. Alfa claims 0-60 mph times of less than 5.1 seconds and I won’t disagree. Of course, this is an Alfa Romeo, and as such it wears great Italian styling behind its distinctive grille. The Giulia is low-slung with a pronounced wedge shape. My wife felt the entry was too low, but I enjoyed it. Entry and egress are aided by four assist handles over the doors. Once inside, the heated red leather seats ensconce you, gripping you nicely in the kidney area to make cornering more fun. There’s also a great wheel to hold on to. The 8-speed automatic transmission has large column-mounted paddle shifters designed to shift gears in less than 100 milliseconds. However, the paddles are large and almost get in the way when you’re not using them. Hitting the turn signal stalk can be fun. There are also unique wiper controls on the right stalk that take some learning. Instrumentation in the swoopy dash consists of clear analog dials with an information panel in between that we set for a digital speedometer. The infotainment screen is too small. On the center console are three knobs. The smaller one is the radio on/off/volume. The large center one works the menus, radio (supposedly) and navigation. On the left is once labeled dna, with settings for “d” for dynamic sports driving mode, “n” for normal driving mode, and “a” for advanced efficiency. A button in the middle of the knob adjusts the calibration of the suspensions in “d” mode. The Giulia has what I call a modern shifter. You park by pushing the “P” button. Pull the shifter toward you with your finger on a button to shift into drive and push it forward to hit reverse. You can’t go from park straight to reverse, but must go to drive or neutral first. While the front seats are comfortable, rear set legroom is tight. There’s also a high center hump to preclude thing a third passenger back there. However, the rear seats are comfortable. But, once seated, your feet are under the front seats and it can be difficult to extricate them. In fact, it can be danged dangerous in an emergency situation. Out back is a useful trunk, but the rear seat backs apparently don’t fold to increase cargo capacity. Overall, the Alfa Romeo Giulia is a performing mid-size sedan on the small end of the scale. It brought back both good and not-so-good memories of previous Giulia's I have driven.